In order to spread their destruction, ovarian cancer cells must break free from their tumor home, travel through the fluid in the peritoneal cavity and attach to the outside of the abdominal organs—surfaces that are, by necessity, not sticky. 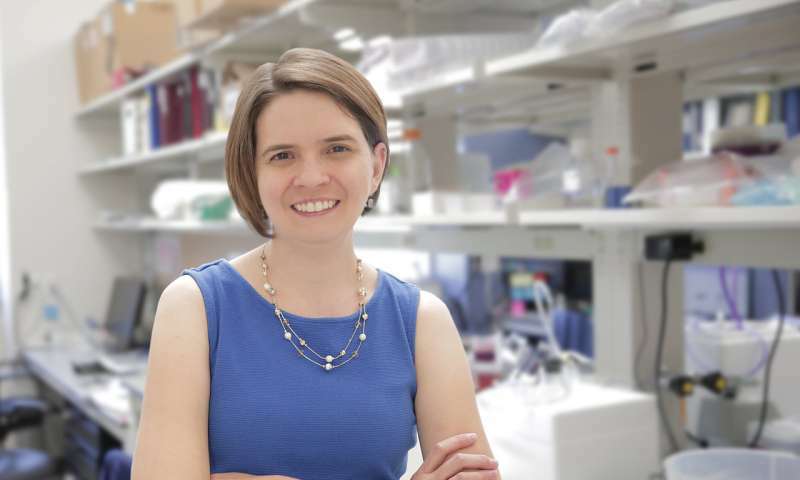 In studying high-grade serous ovarian cancer—the most common but also most aggressive type—Kreeger, postdoctoral fellow Molly Carroll and other lab members have teased out how one type of immune cells helps cancer cells attach in the peritoneal cavity, enabling metastasis. Higher levels of these immune cells, called alternatively activated macrophages, are associated with worse outcomes. But the question remained: Do these macrophages encourage metastasis? "For me that was one of those scientific 'ah ha' moments—the interactions between the normal cells in our body can influence metastasis. In other words, it's not all about the tumor cell," says Kreeger. A preliminary experiment in mice validated those results, while human samples—obtained through collaborators in the UW-Madison School of Medicine and Public Health—showed that patients with ovarian cancer had higher levels of MIP-1β and P-selectin.